Mercy Lavinia Warren Bump Stratton or ‘Vinnie’ to her friends and family was an actual woman in history standing a mere 32 inches tall. 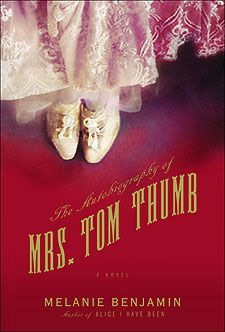 Prior to reading this novel I hadn’t heard Mrs. Tom Thumb. What a delight to learn about her rich history and character through Melanie Benjamin’s autobiographical novel. Wow does that seem like a conflict of terms. Vinnie had hoped to write an autobiography of her life, and had taken notes and written journals toward that goal. Her dream was not fulfilled and credit goes to Melanie Benjamin for bringing Vinnie’s story to light. As a ‘dwarf’ she had quite the difficult life just trying to see eye to eye with the world. She was a feisty gal though and by age 16 she was the school marm at the local school after having exceeded at her own schooling. Colonel Wood, a man with dollar signs in his eyes lures Vinnie away under the pretense of her performing and making a big name for herself, only to find herself working on a river boat with other ‘misfits’. The world was not kind and Vinnie soon found many reasons that she should have stayed home with her family and her one sister Minnie who was the same size as she. The Civil War ended Vinnie’s dreadful showcase and she was able to return home. Still discontent with the boringness of living in a small town she wrote to PT Barnum in the hopes of joining his troupe. She ended up meeting with him, and found in him a friend and confident as well as a true artist in his field. Through Mr. Barnum she met her future husband Charles Stratton, or Mr. Tom Thumb. Another miniature person their marriage appeared to be a match made in heaven, but was in appearance only. Never quite content with her fame, and her size it seemed Vinnie missed out on just living. This was an exciting story with great historical facts and descriptions. Melanie Benjamin brings an old icon into new light for a new generation. It has been fun to meet Vinnie and get to know her and her sister Minnie, one having fame and not fully living, the other to learning contentment and happiness. I loved the relationship dynamics and how Vinnie was able to interact with such an array of characters as she made her debut. The characters were vivid and real and it did indeed feel as if we were reading a true autobiography. Thanks for the wonderful review of Melanie's latest. I'm glad you enjoyed it. I hope your readers will check it out. I think this is an amazing story! Not just the book but also how it came to be. I am definitely adding this one to my TBR list. I read and reviewed this book as well. I thought it was very well written. I love historical books and this one had so much history in it! Very interesting.